Yes, it was a little over a year ago when the younger daughter, two friends, and I took a spinning class from a little place in Comfort, Texas. At the time, I was convinced spinning was not for me. The lady who conducted the class was nice and obviously extremely knowledgeable, but she was not well prepared for a class. While one of my friends brought her own wheel, none of the other wheels had been set up or tested prior to our arrival. The Schacht Sidekick that I was on was not put together properly and pieces, including the orifice and flyer, kept falling off, as I was attempting to learn to spin. Not to mention, one of the treadles had not been fully attached, either. The younger daughter had similar issues with hers. The lady explained these were display models and had never been used. I felt as though we had been set up for failure. In all, I did not learn much of anything, other than it was a completely frustrating experience. So much so, it put me off even thinking of spinning for a year. A couple of weeks ago, I had a string of nights with disrupted sleep, which left me somewhat zombie-like. 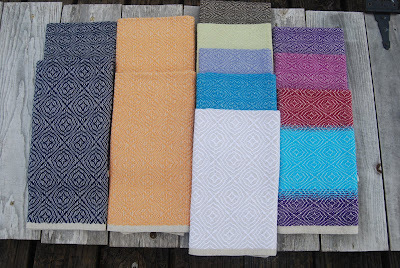 I did not have the energy, physically or mentally, to weave, knit, or read, but I do not sit still very well. 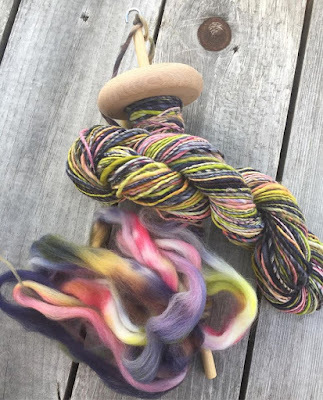 As I was rummaging around, trying to find something to occupy me, I caught sight of the roving I had purchased to make into yarn with the drop spindle I acquired the week prior to the ill-fated spinning lesson. 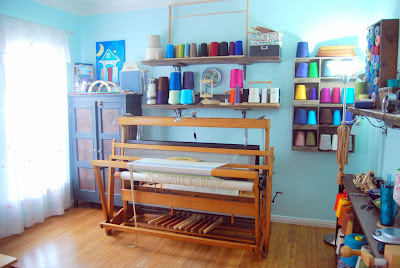 With nothing to lose, I picked up the spindle and the roving and settled into a large, comfy, leather chair to join the husband as he watched college baseball. Within a few hours, I had a ball of yarn attached to the spindle, which I wound onto a knitty knotty. From there, I soaked and dried it. The next day, I sat down and did it again. Not bad for a second attempt at spinning. I liked the process, and I liked the results. Although, there was room for vast improvement on both fronts. With that in mind, I went to Lucky Ewe and bought two more braids of roving. 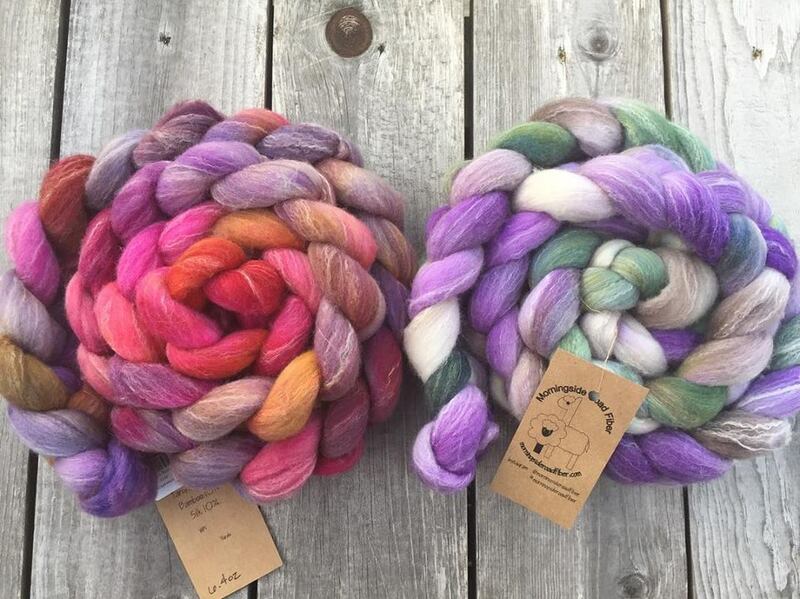 These are both from Morningside Road Fibers in a blend of Targhee/Bamboo/Silk. 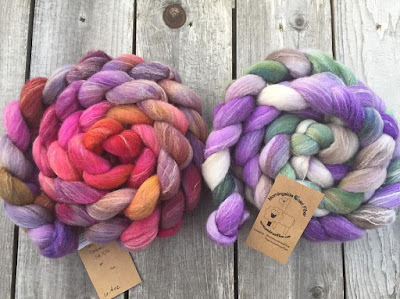 My thought was to use the spindle to make yarn with these, and if I still liked it, then I would consider purchasing a wheel. Half-way through the braid on the right, I began researching wheels and contacted the lovely Linda at Lucky Ewe to ask if she offered spinning lessons. She did! The lesson with Linda was a dream! She brought in both of her personal wheels, an Ashford Traditional single treadle and a Majacraft Suzie. When I arrived, she had them both set up and ready to go. It was clear she had been spinning on them to make sure all was well. I sincerely appreciated that. The Ashford was a lovely wheel, but I admit I may not have been coordinated enough to master the single treadle very well. We covered the mechanics, and Linda let me work on it a while, as she gently provided tips and instruction. It appeared I treadled much faster than I drafted and fed fiber to the wheel. Once I kind of had the basics down on the Ashford, she moved the Majacraft wheel to sit in front of me. I have never driven a Maserati or a Lamborghini, but I imagine Majacraft is the spinning wheel equivalent. It was AMAZINGLY smooth and responsive! First of all, the double treadle is definitely the way to go, as it provided so much better control. Secondly, it was much easier and comfortable to treadle. Thirdly, I was actually spinning! Again, I treadled too fast. Once I got home, I continued researching how to spin, spinning wheels, which wheels were beginner friendly, and began comparing them. In studying wheels, I began with figuring out how they actually work, what the components were, their names, etc. Right off the bat, I eliminated the traditional looking wheels, as they occupied more physical space than I wanted to surrender. So, the huge Rapunzel-like spinning wheels were off the list. Two friends of mine, well versed with spinning, recommended the Schacht Matchless wheel. 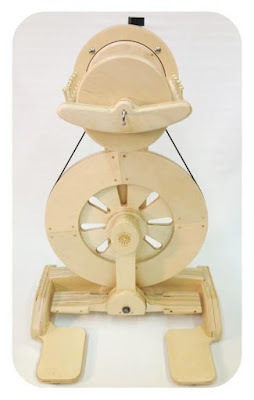 I am actually a Schacht fan and was leaning toward that brand, as I used to have a Schacht table loom that I thought was well and solidly made. The Ashford Kiwi 2 was highly recommended as a beginner's wheel in several articles I read, too; however, they come unfinished, and I had no desire to finish one before I could start spinning. As well, I understood people tended to out grow them quickly. However, the Spinolution Echo crossed my screen early on with its contemporary and modular design, and I was intrigued. The reviews, both written and on YouTube, were extremely positive. It also helped that the YouTube lady from whom I was "learning" how to spin used a Spinolution model. As I delved into why people were so enthusiastic about this wheel, I learned how innovatively it was designed. On the Echo, the orifice is attached with earth magnets that make it simple to remove. The bobbin is also attached by magnets. It pops out, another pops in, the orifice snaps back on, and one is good to go in seconds! A great deal of thought appears to have gone into the Spinolution design, including the bobbin. To begin weaving, one must attach a leader yarn onto the bobbin to which the fiber can attach and be spun into yarn. Echo features bobbins with little clips at each end to attach one end of the leader yarn. It is a simple little thing, but extremely thoughtful. A friend had sent me a video in German to instruct me on how to tie on the leader yarn. I thanked her, but with the Echo bobbin, it was completely unnecessary. There is a very long video review of the Echo, but the quality of her video is excellent. At the 20:30 mark, she discusses how to attach the leader to the bobbin. Further, the orifice on the Echo is a hook, instead of an opening through which the yarn is threaded with the use of a specialty tool. On the Echo, there is no threading, no special tool, and the whole process is simplified. As the wheel on the Echo uses ball bearings to drive it, frequent oiling is not required. Due to the modular design, the Echo also holds different size bobbins from 4 ounces to 16 ounces. Each size has different whorl sizes with different ratios. Without getting into the ratios and what they are used for, I will simply link that information here. Now, I know the absolute best and most solid advice was to try out as many wheels as possible and choose the best one for me; however, as much as I wanted to test drive an Echo, the dealer in San Antonio did not have any models available and was not sure when she would have any in stock. The next closest dealer was in Dallas, four hours away. So, it was with a complete leap of faith (based on solid research) that I made my purchase. UPS is expected to deliver it this afternoon!! Trust me, I will keep you posted!